Streamline your scheduling with these apps when Sunrise shuts down at the end of this month. At the end of the month, the sun will set on Sunrise, one of the most beloved calendar apps. That will leave a scheduling void for Android and iOS users who prized the app for its intuitive interface, third-party app integration, and support for Google Calendar, Microsoft Exchange, and iCloud. Though Sunrise leaves some pretty big shoes to fill, there are some worthy alternatives that can take its place. Here’s a look at four of the best. Fantastical 2 offers a split-screen view that lets you see your month and a list of your appointments all at once. For Apple users, Fantastical gets the vote for best Sunrise replacement. 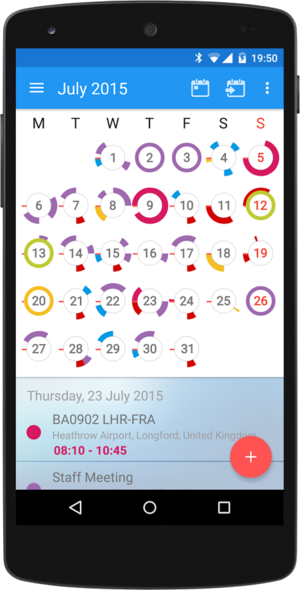 The app sports a sleek interface and allows you to display your calendar in either portrait or landscape mode. It also offers a split-screen view that lets you see your month and a list of your appointments all at once. One of Fantastical’s biggest draws is that you can add events using natural language. Type “Call Sarah today at 2:00” and the app will pull up everyone named Sarah in your contacts. Once you confirm the appropriate one, Fantastical will create the calendar entry. You can even have the app email her an invite. Fantastical supports iCloud, Google Calendar, and Exchange. Other pluses include Facebook event integration, widget support, map views for events with an address, and a raft of customization options. All this doesn’t come cheap—Fantastical will run you $5 for the iPhone version, $10 for iPad, and a whopping $40 for Mac OS—but it’s well worth the expense if you’re committed to your calendar. If you want to view all your daily agenda details from a central hub, Calendars 5 is your app. It pulls your data from iOS or Google Calendar and displays it alongside your Reminders and other tasks. You can view your schedule in month, week, day, or agenda views. Calendars 5 can send you text alerts to make sure you don’t miss events. As with Fantastical you can use natural language to add events, and the app will send you notifications of upcoming appointments. You can even have it send you a text alert as the event draws near to be sure you don’t miss it. Calendars 5 costs $7 for iPhone or iPad. Any.do’s Cal app makes it easy to manage your schedule one day at a time. If you’re less concerned with long-term scheduling than with the day ahead, then Cal will keep you on course. This free app from the developers of the popular task manager Any.do puts the focus on managing your day-to-day commitments. The minute you open the app, you’re presented with a list of the current day’s appointments and to-do’s—the latter fetched from your Any.do account, naturally. 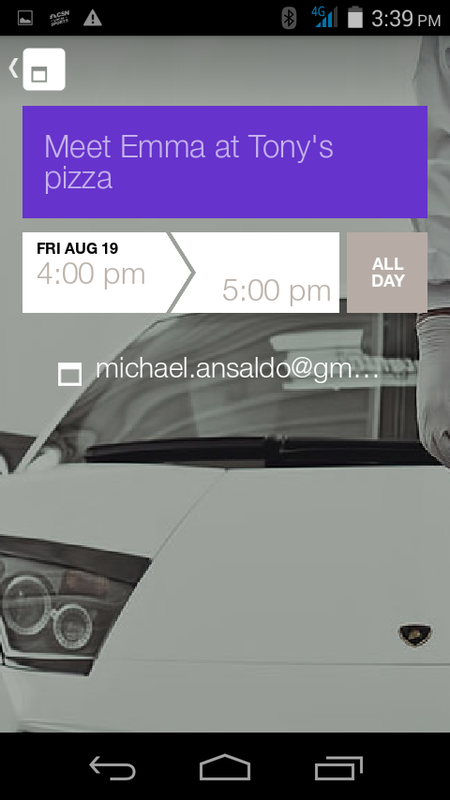 Cal has a beautiful, intuitive design that makes it easy to create events (it supports voice input and predictive text) and add invitees and locations. Birthdays are also a big deal in Cal; the app makes it easy to send someone a gift from Amazon or Gift.com or write a birthday message on their Facebook wall. Cal is admittedly not for those who want a longer view of their commitments. Monthly view only displays an underline on the dates you have events scheduled and a weekly view isn’t offered. But if you want a simple, clean calendar to keep you on task, it can’t be beat. Cal is free for iOS and Android. CloudCal uses “magic circles” to let you see your appointments at a glance. 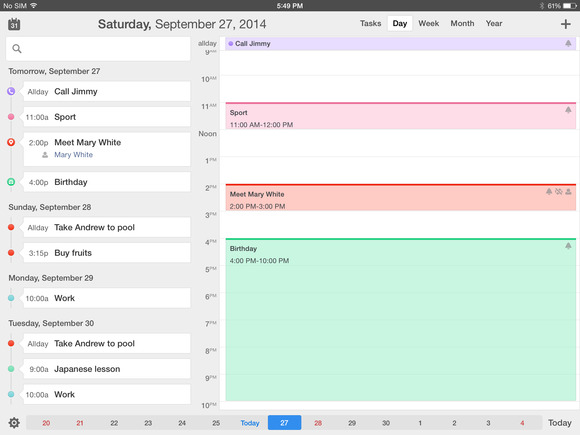 CloudCal puts a twist on the typical calendar view for the visually oriented. Using a unique system dubbed “magic circles,” this app turns each calendar day into a clock face and colors in the areas that correspond to your appointments. With just a glance, you can see when you’re available and when you’re not. CloudCal also features natural language input, gesture commands, and customizable reviews, as well as task-management capabilities via its companion app CloudTasks or Google Tasks. The Android-only app is free to install, but more advanced features require an in-app purchase.